Clinic Day here on the Tibetan Plateau. Typically the queue is quiet and reserved. I am often amazed by serene, smiling, weather-worn and wrinkled faces . . a stark contrast to each calamity that hides underneath a bloody bandage or crooked arm. Today, however, one hunched over Yak herder, head in his hands paces in and out of the line. He shuffles and stomps, kicking glacial dust into the air, as if in a frantic rain dance on this arid plain. I gently pull back his hands, teary scarlet eyes look back, telling me the whole story in a terrified stare. The affected patient does not suffer pain until 6 to 12 hours after the exposure, when the patient develops bilateral eye pain, injection, photophobia, and inability to open the eyes. This delay from time of light exposure is absolutely characteristic. The patient is typically distraught and pacing or rocking, due to severe pain. 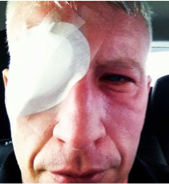 Even Anderson Cooper is not immune . . There may be redness and swelling of the face and lids. Visual acuity is typically mildly to moderately reduced, but patients are often too hesitant to even open their eyes. Penlight examination reveals tearing, and generalized redness and swelling conjunctiva over the eye itself. There is no discharge or involvement of conjunctiva under the eyelids, which distinguishes snow-blindness from conjunctivitis. For advanced eye examiners: The cornea may appear mildly hazy. Instillation of fluorescein reveals superficial punctuate staining of the cornea in the interpalpebral fissure. The remainder of the eye examination is unremarkable. Treatment of photokeratitis is supportive, which means having sympathy for the fact that this is an exceptionally painful condition (think bad sunburn on your back and now put that on your eyeballs). ORAL ANALGESICS — The pain from photokeratitis is typically severe, especially at the onset. Mild oral opioids are usually necessary for adequate pain relief. I find that Vicodin 5/325mg every 4 to 6 hours or even oxycodone 5 to 10 mg every 4 to 6 hours is needed for the first 24 to 48 hours. Pain control permits sleep and helps recovery. Supplementing this with over the counter NSAIDS (e.g. Aleve, Ibuprofen) can also help. I’ve also used topical ketorolac 0.5% drops in eye 4 times a day with success. ANTIBIOTIC OINTMENTS — Topical antibiotic ointments can improve comfort and may provide prophylaxis against infection. Typically an antibiotic ointment (eg, erythromycin, bacitracin, or polymyxin-bacitracin), prescribed three to four times daily for two to three days. CYCLOPLEGIC DROPS (cyclopentolate 1 percent, homatropine 2 to 5 percent, or scopolamine 0.25 percent). However, these drugs can result in pupil dilation lasting DAYS, and in my experience this often distresses the patient that they are not getting better even though the pain may be resolving. You can consider using, just advise the patient that this may occur. PATCHING of the worse eye may offer some relief. However, it has not been proven to speed healing after corneal abrasion, and is unlikely to improve healing after UV irradiation. I personally don’t suggest this. Anyone who has ever taken care of the sun burnt or abraded eye knows the power of these. You put the drops in. They feel better and ask if they can take the drops home. We say no. Why? My emergency medical textbooks will dogmatically outline the risks: Both say that topical anesthetics are contraindicated in the management of corneal abrasions and the healing will be different due to sensation issues. Closer examination of this claim reveals the evidence is antiquated. Some of these claims are based on animal studies only. The only known studies on human complications date back as old as 1968. The key summary of the 15 human case reports outlined in these references, is that 14 patients used it inappropriately. All cases used a solution that was higher than we would send patients home with. In some these cases the anesthetics were used much more frequently than we are considering (at most 2-3 days). Are there any safety studies? So the bottom line . .
We still need a larger study looking at safety but the dogma saying that corneal anesthetics are unsafe appears to be based on an unsound research base. The complications, if any seem unlikely and small. I prescribe medications all the time that impart more risk. So what did I do for my yak herder? I treated him with proparacaine for a few days. He was happy. He gave me some dried goat meat. I’m not sure how happy I was about that. Upadhyay MP, Karmacharya PC, Koirala S, et al. The Bhaktapur eye study: ocular trauma and antibiotic prophylaxis for the prevention of corneal ulceration in Nepal. Br J Ophthalmol 2001; 85:388. Turner A, Rabiu M. Patching for corneal abrasion. Cochrane Database Syst Rev 2006; :CD004764.